Embryo adoption. A controversial subject? A 21st century subject? Well, whatever it is, it’s a subject close to my heart these days. What do you do when you desperately want a baby but for medical reasons are unable to conceive in the typical way? What do you do when you desperately want a baby, but your insurance doesn’t cover IVF, and there’s no way you could pay for IVF right out of your pocket? Many people consider adoption, which is an honorable thing to do – for both the birth parent(s) and the adoptive parents. In my line of work, I’ve witnessed many adoptions happen. They used to be fairly commonplace, but those days are gone. Adoptions, whether they are open (families stay in contact) or closed (totally private) are few and far between. Once in a while you still see an adoption happen. A little more frequently we see babies end up in Foster Care for whatever reason. For instance, a couple years back we had a mom from New York deliver her baby here in the northwest, and then she returned to New York, and as far as I’m aware, she was never seen again. That baby had some medical issues and ended up in foster care. I sure do admire couples who can open their hearts to fostering… often they see the baby they have loved and nurtured returned to the birth parent. So when my son and DIL began to investigate embryo adoption as an alternative to “regular” adoption, I was intrigued. Embryo adoption happens also as a gift of love. My son and DIL were “matched” with a couple who were done growing their family and had several frozen embryos left over from IVF. The donor family (as well as my family) believe that life begins at conception and they didn’t want to simply destroy the left over fertilized and frozen embryos. They wanted to give their embryos a chance at life. My son and DIL want a baby and want very much to be parents. So, it was with a mutual agreement (and legal documents) that son and DIL adopted the embryos. Much like IVF, one must prepare for the frozen embryo transfer (FET). DIL was given pills and shots of different hormones to get her body ready to accept and nurture the tiny embryos. The preparation process took about a month. Then one day in August, it was time. 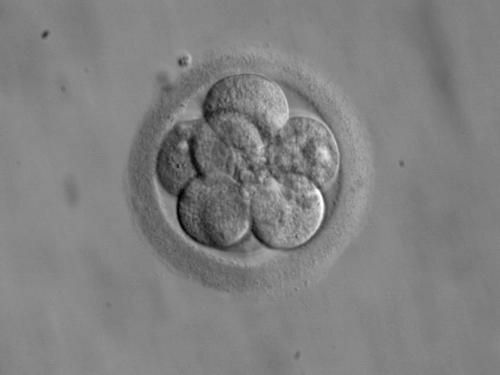 Two tiny, 6 day blastocyst embryos were carefully transferred. After the transfer, DIL was instructed to take it really easy for 48 hours. Which she did, hoping and praying all the time that the little ones were reaching out and grabbing tightly to life. Approximately 10 days later she had a pregnancy test in the form of a blood test – they check something called the “Beta”. Hey, I’m a nurse and I don’t really know what a Beta is, but we were overjoyed to learn that DIL’s “Beta” was around 520. She did a home pregnancy test and it was also positive! Three days later, another blood test was scheduled. A good result would show that the “Beta” had doubled. DIL’s Beta was 2490!!! This was exceptional news! So, we’re nearly up to date here. DIL is indeed pregnant and suffering some of the typical symptoms… stomach queasiness and being oh-so-tired. Next week the first ultrasound is scheduled – we’ll find out if one or possibly two little babies are growing in there! DIL will also get her “due date”, and we’ll continue to pray for a happy, healthy pregnancy. Of course I’ll do regular updates as it all progresses. The miracle of embryo adoption. The miracle of life. This entry was posted in Embryo adoption/Pregnancy and tagged Pregnancy. Bookmark the permalink. Wow, that is awesome! Best wishes to all. What an amazing journey all of you are on. I will be interested in reading more. Awesome indeed and I will be hoping for a safe pregnancy too….best wishes and the best of luck to them both. For those who are wondering…it’s offically TWINS!!!! !